Chances to Learn - In addition to studying your major focus, you can learn to play different instruments, to sing, to understand music theory, to act, to dance, to stage-fight, and to write music. Immediate Opportunities - As a freshman or transfer student, you have the same opportunities as returning students. Perform - Be part of the 20% of Reinhardt's student body who sing or play an instrument in one of Reinhardt's ensembles or perform in our acting troups. All music majors perform on mid-semester or end-of-the-semester recitals. Junior and senior level music majors perform half and full recitals. Music theatre and theatre majors perform a senior show-case show. Concerts - At Reinhardt you will have access to a wide array of concerts throughout the year. 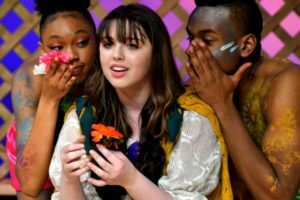 FPAC events include international prize-winning performers, performances by student ensembles, faculty and student performances, and general interest programs. A family atmosphere and mentoring - As a performing arts major, you will work closely with professors and students both outside and inside class. The Falany Performing Arts Center, FPAC, will truly become your home away from home. You'll learn as much in conversation and in practice as you do in the classroom. One-of-a-Kind Facilities - The Falany Performing Arts Center provides an exceptional backdrop for learning, practicing, and performing. Expert Faculty - Our music faculty includes doctorates in Music Education, doctorates in performance, one Past President of the Georgia Music Educators Association, and one Past President of the Georgia Music Teachers Association. Our faculty also includes two published authors of textbooks, Dove and Grammy Award nominees and winners, and two who vote for the Grammys each year. Be part of a growing School of Performing Arts- 200+ students are majors or non-major participant in performing arts ensembles.